A copper plate engraving by Benjamin Cole issued in Stow's Survey of London in 1754. Stow's magnificent and comprehensive Survey of London first appeared in 1720 but such was its popularity and importance that it was reissued many times, including a fully updated version that appeared in 1754. The publishers announced with great pride that "It has now been brought down to the present time by Careful Hands". Many engravers and artists were employed both in the initial composition and in the later modifications. Many illustrations were copied from the work of Johannes Kip in The New Theatre of Great Britain and published on a reduced scale. 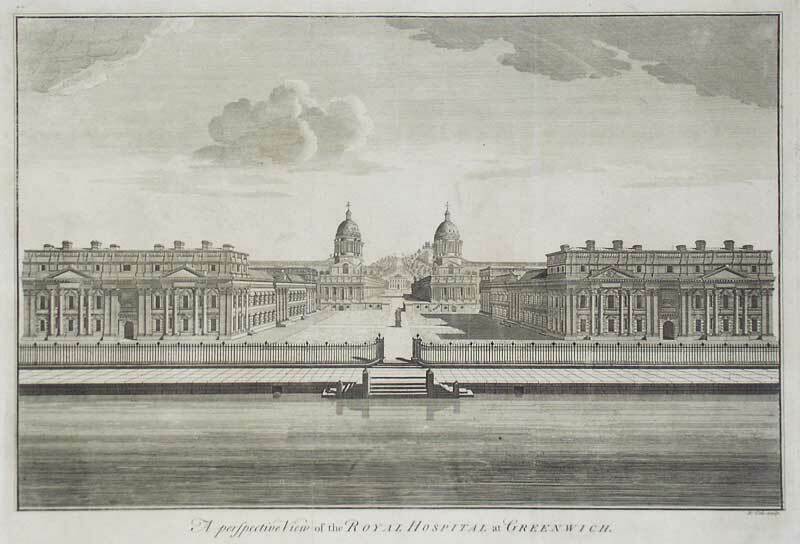 Charles II had ambitious plans for the construction of a new royal palace at Greenwich but the scheme hit the buffers through lack of investment and it was finally left to Queen Mary to revisit the project and decree that the buildings should be completed and used to provide a Royal Hospital for disabled seamen. These buildings were designed by Wren and Hawksmoor, the leading architects of the day, and form the basis for The Royal Naval College that still stands to this day. Samuel Johnson came to live in Greenwich in 1737 and was moved by the sight of such imposing architecture: On Thames's bank in silent thought we stood: Where Greenwich smiles upon the silver flood; Pleased with the seat which gave Eliza birth, We kneel and kiss the consecrated earth.